Image caption The survey suggests consumer spending is likely to remain weak. Scots are growing increasingly pessimistic about the state of the economy, according to research by Ipsos MORI. The market research agency found that six out of ten people believed economic conditions would get worse over the next year. 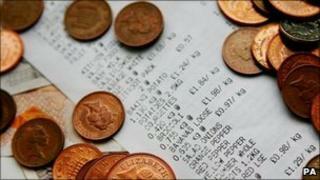 The survey suggested consumer spending was likely to remain weak. More than half the people interviewed said they were not planning to take a holiday abroad over the next 12 months. Ipsos MORI's "propensity to buy" tracking measure also showed that only 14% of people said they planned to buy or replace a car. The research showed that Scots are more pessimistic about their own economy than about the UK situation. While 60% thought economic conditions in Scotland would get worse - 54% thought the UK situation would deteriorate. Ipsos MORI said the gap in perception between the economies has been a consistent one and "raises intriguing questions about national confidence". The economy has been one of the main concerns since MORI began monitoring the public mood in Scotland, however health and education have slipped down the agenda since the general election. The company said those issues were given prominence in the election campaign but the economy is now seen as being more important. Unemployment which was described by about 45% as the most important issue facing Scotland is now the major concern for 27%. However Ipsos MORI said that it "might expect that to change as public sector jobs are cut".